Okay, it’s taken me a bit longer to get back to this…I snapped so many photos that my hard drive filled up and I had to spend hours moving old stuff to make room to work on more. 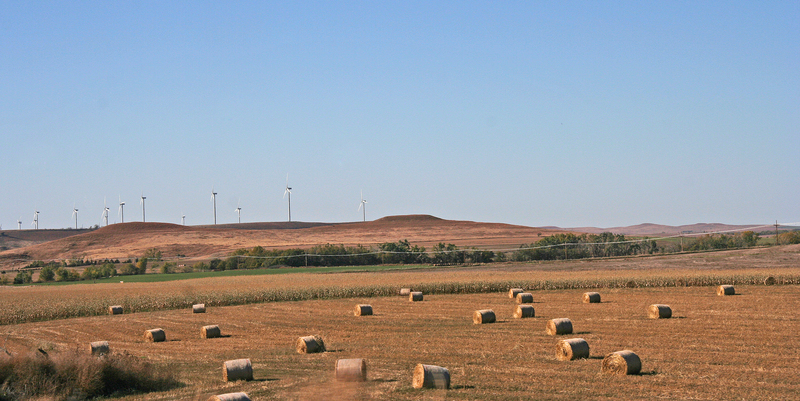 On Tuesday morning, we headed west 250 miles to Hays, my home town. 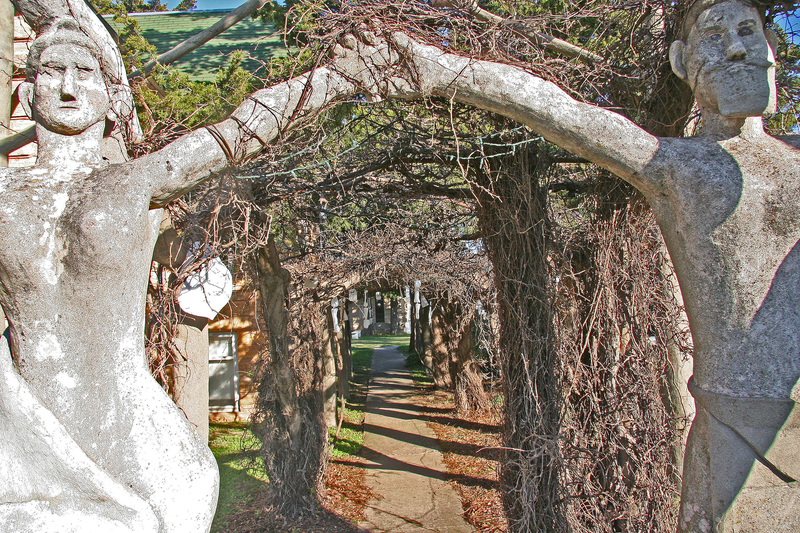 On the way we stopped in the little town of Lucas, famous for its Garden of Eden, the creation of an outsider artist, S.P. 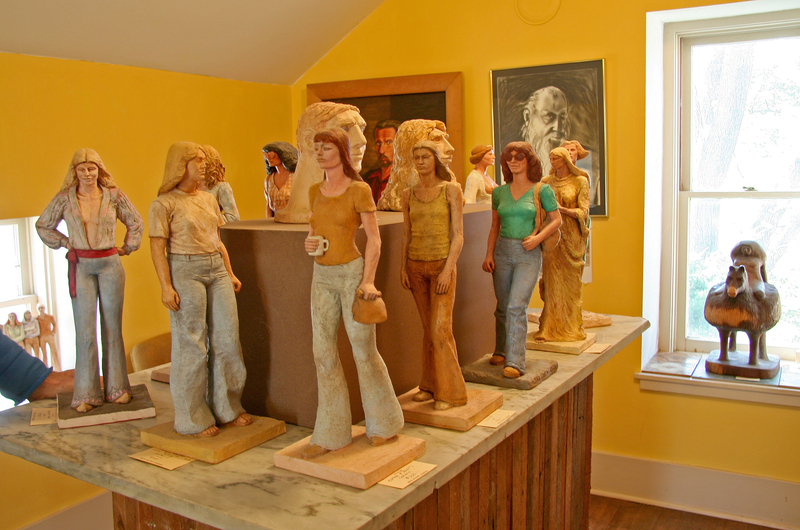 Dinsmore, who began building his house of limestone “logs” and filling his yard with concrete sculptures of Adam and Eve, statues illustrating his anti-trust political ideals, and the world’s only concrete flag. He was a civil war vet who began his project at 64, and at 82 married a teenage bride and had a couple of kids with her. His body is on exhibit behind glass in his concrete mausleum…he’s not looking so good these days. 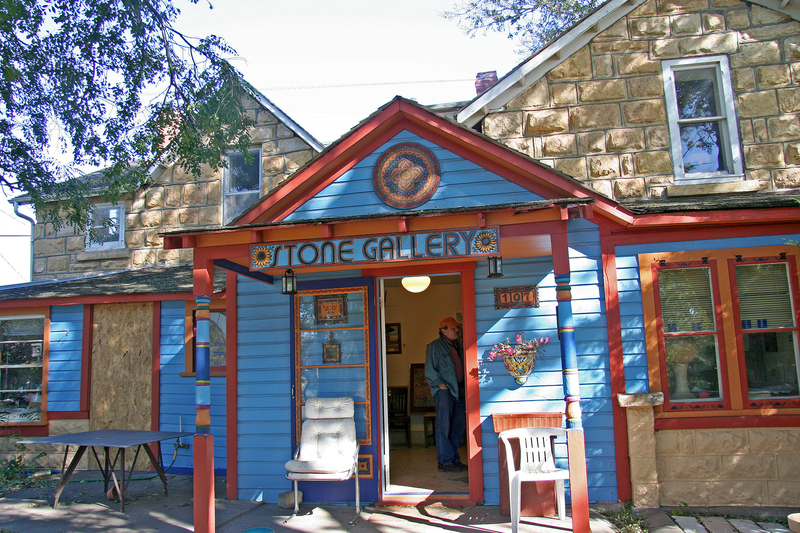 Then it was on to Hays, and straight to Pete Felten’s Stone Gallery. 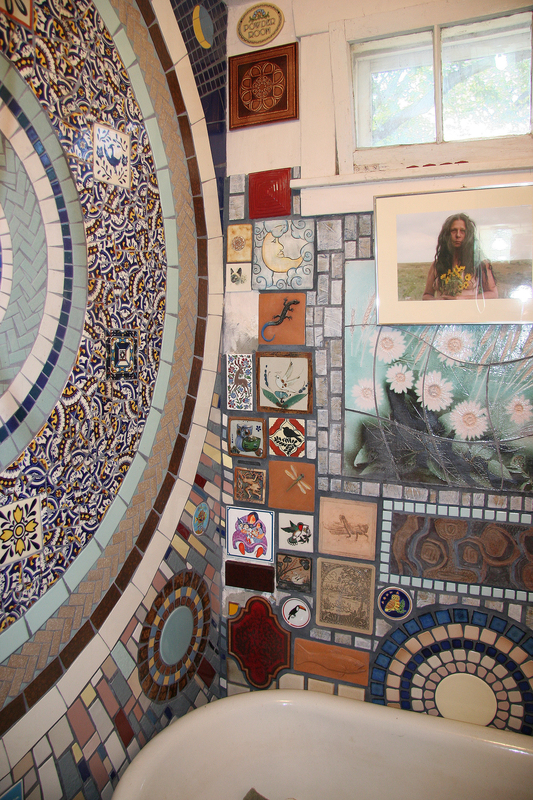 Pete and I have been friends since I was 12 and he was 25; curiosity drove me to the studio of the local “weird artist” and he became my art-encourager, source of information and a lifelong friend. Since I left Hays we’ve met up several times for adventures and travels. He’s a wise and unpretentious man who spends most of his time carving stone, reading, collecting odd things that appeal to him, and studying old movies. I hadn’t seen him for a few years, and it was really wonderful to have time with him. Below is a series he’s been working on for a few years, the Walking Women. 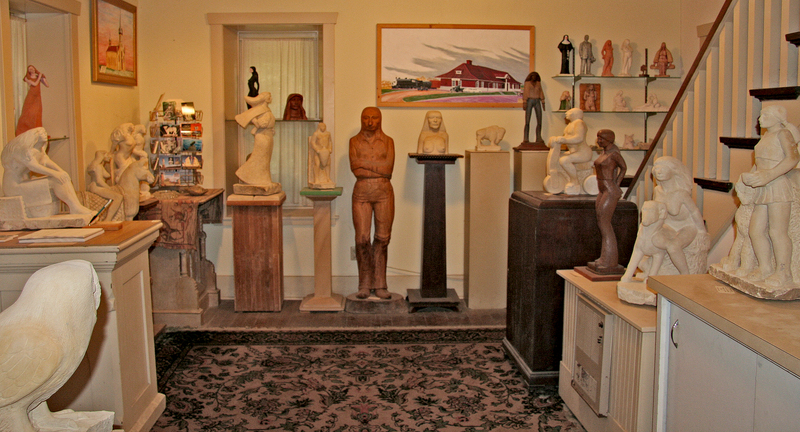 The sculpture on the far right, in the window, is a mahogany piece which I’ve loved for ages, and I bought it! Pete knows every nook and cranny of Hays, and showed us all the changes that have occurred in the 17 years since I’ve been there. 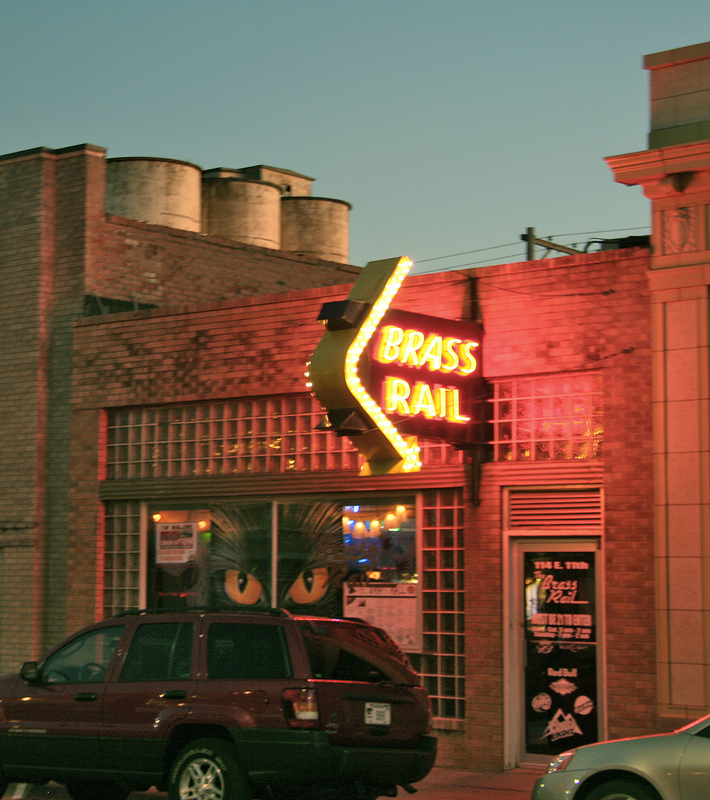 A couple of local spots haven’t changed at all: The Brass Rail, watering hole for Ft Hays University students for about 50 years, where I had my first date with my ex-husband Bill (note grain elevators in the background), and Al’s Chickenette, which has served up its “special recipe” since 1946. 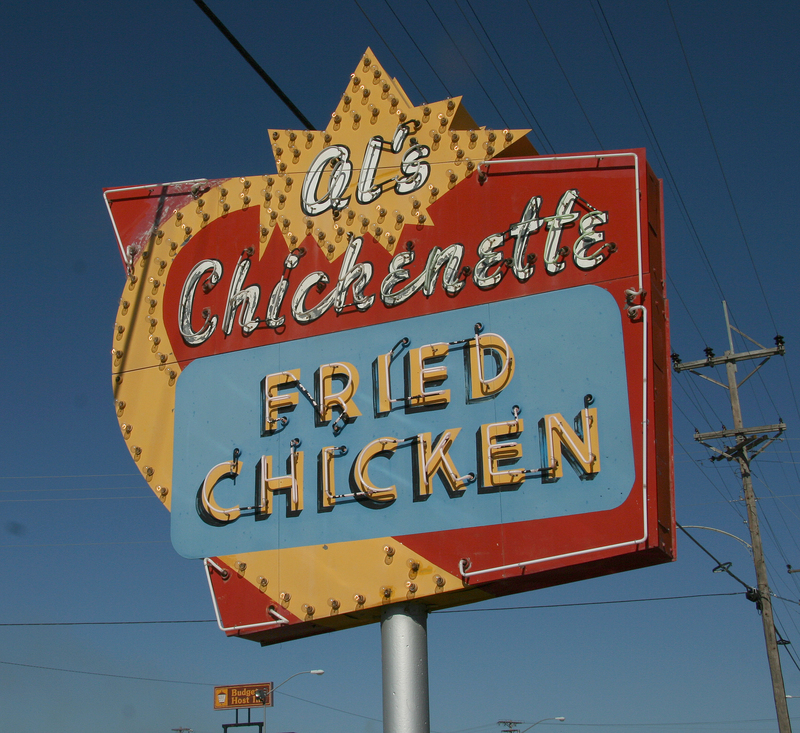 We had lunch there (chicken livers, an old favorite of mine which just is not seen on menus east of Missouri) and I think they were still using the same grease. It was a busy couple of days. We visited Old Fort Hays, built to protect the railroad workers from attacking Indians (they never attacked) and the new Sternberg Museum. The museum used to be housed on the college campus, next to my dad’s science building, and it was my playground when I was little. I knew all the bones and rocks and stuffed animals. 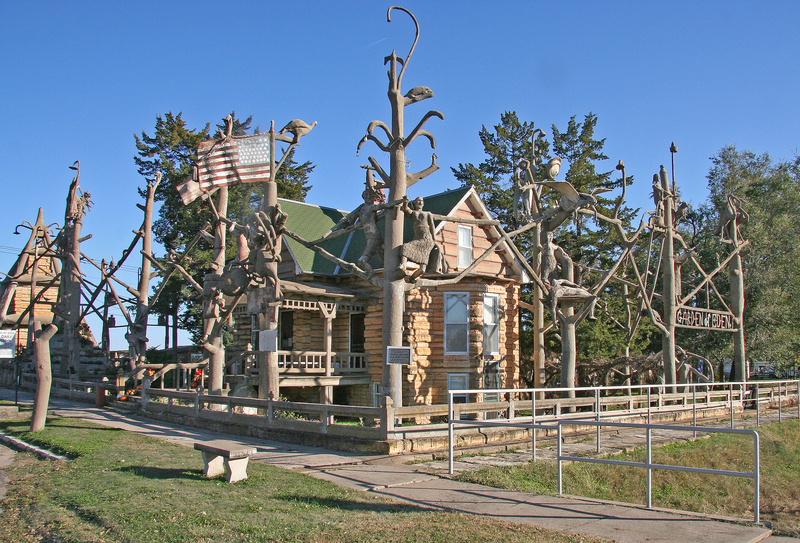 It’s moved to the eastern edge of town now, all gussied up, and it’s been quite a popular tourist spot (if there really are any Kansas tourists) but I miss the old staid version. I am having a hell of a time getting the photos to go where I want them to, to type where I want to type. 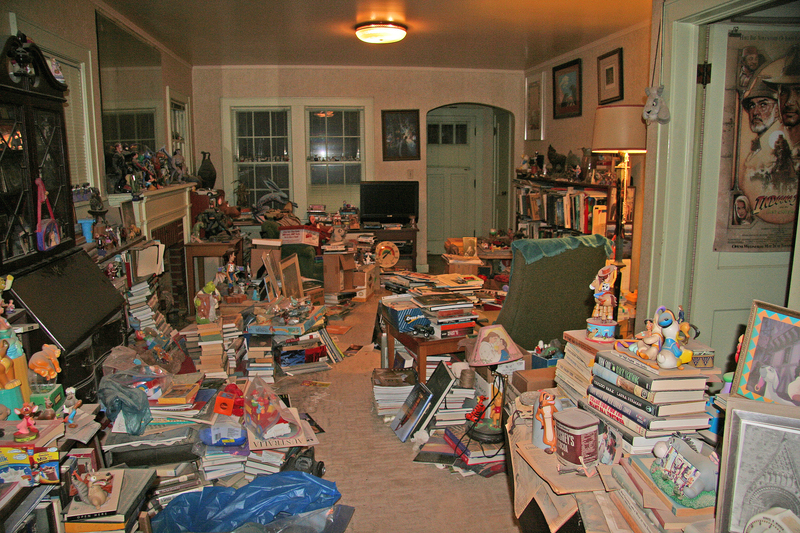 Stuff keeps moving around and disappearing with a will of its own. Sooo…I’m just going to write the rest of this and TRY to insert all the rest of the pictures at the end, because I’m getting really really tired of diddling with it. 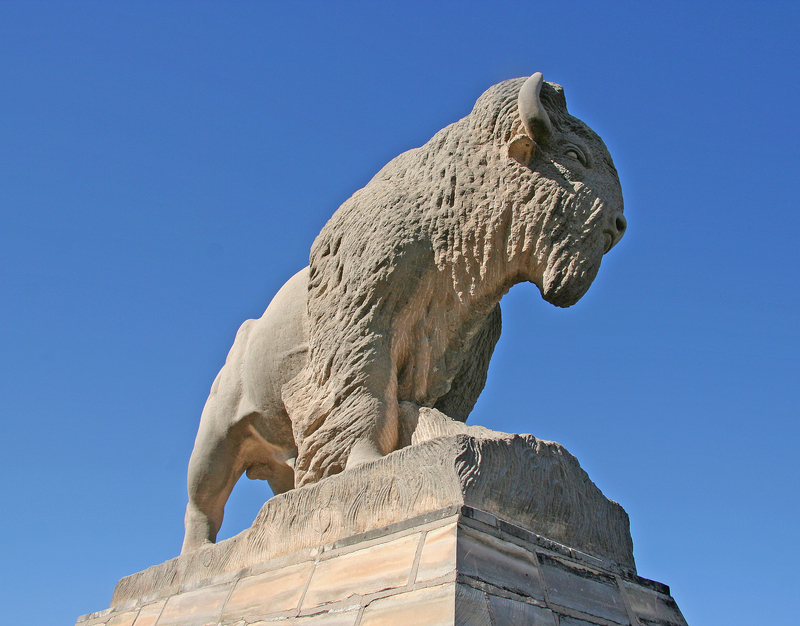 We saw Pete’s 1961 statue, The Monarch of the Plains, a buffalo gazing over the prairies. We made a pilgrimage to my old childhood home, next to my elementary school, and it was sad seeing the place so run-down and ruined when my parents had tended it so lovingly. Hays has been improved, I suppose…they’ve rebricked Main Street, remodelled the library, and some trendy cafes and shops have moved into the downtown spaces, but it’s not a lovely town. 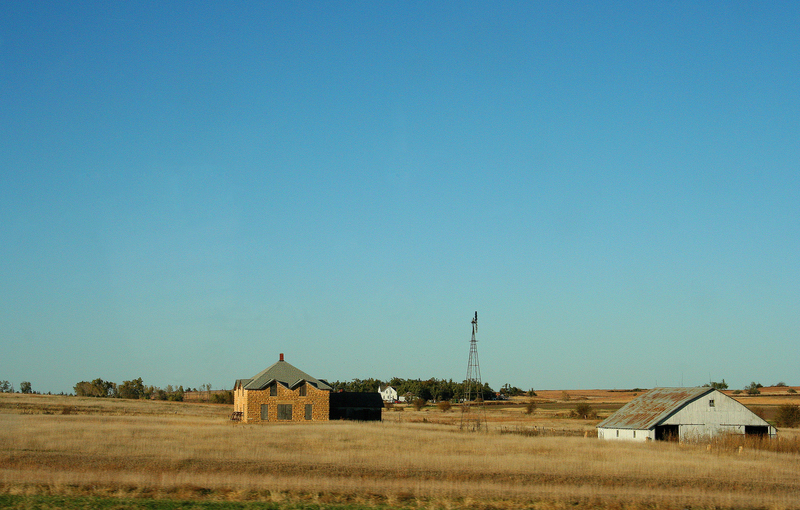 It was good to revisit my roots, but I had had enough by the time we departed and started the long drive back east. I managed to squeeze in a brief chat with old friend John Bird, who has been the Democratic Chairman of Kansas (YES, there ARE some Democrats in the reddest of states!) We stopped in Kansas City overnight and I dropped off samples of my work at a couple of galleries, then drove on to Eureka Illinois, where my daughter Jessica teaches at Ronald Reagan’s alma mater. 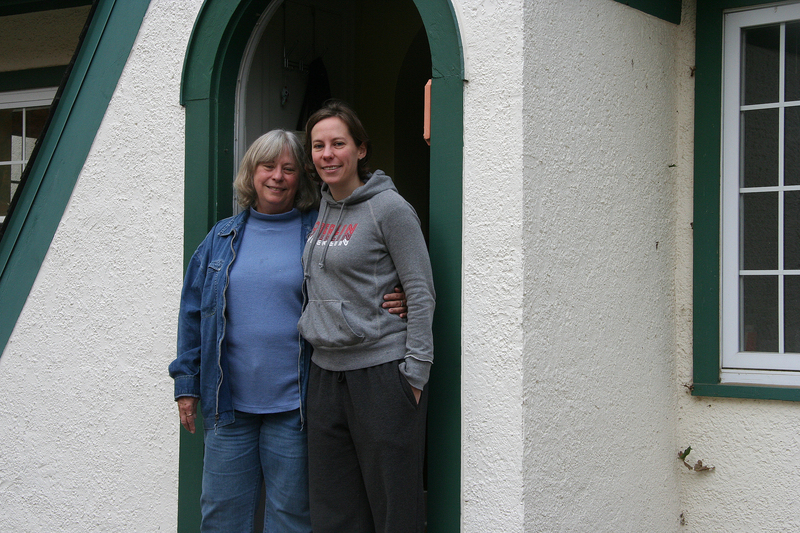 She treated us to a delicious vegetarian dinner–all local and organic food–and then we just plowed on back to New York with an overnight stop at Kent, Ohio. And that’s my story. It will probably be a long long time before I visit Kansas again, but it was good to see those vast skies and breathe its wonderful air. And here are the pictures I gave up on putting where I wanted them. Actually, not. I’m just going to make a new post and hope the pictures show up there…I entered them and they’re not showing up. Sigh. Fish within a Fish...the most famous piece in the museum, one of only 2 or 3 such specimens in existence.